As I've stated in many of my previous posts, my two sons are hit or miss with eating a well rounded breakfast. They prefer sugary cereal or snacks and I'm lucky if they will eat anything with protein or any form or nutrition. In the last couple of months I have been experimenting with various breakfast recipes in an attempt to add something healthier into my two boys breakfast routine. The July issue of Bon Appetit had a recipe for Spelt Pancakes, which looked like the perfect healthy breakfast idea for my two boys. This recipe has 13 ingredients and goes together very quickly. I had no problem finding any of the specialized flours in the health food section of my local grocery store. Instead of using rice or soy milk I used whole cow's milk, since that is what I already had on hand. One word of caution for this recipe, the pancakes seemed to brown quicker than pancakes made with all-purpose flour, so I kept the temp lower on my gas stove. My two year old loved this recipe. 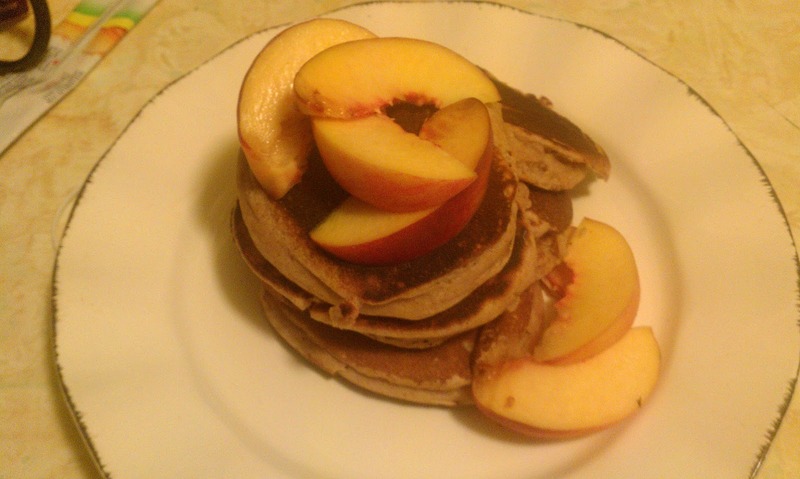 I served the pancakes with fresh peaches for breakfast, which was a hit. He went back multiple times throughout the day for more pancakes, which I topped with homemade peanut butter (recipe to be posted later). This recipe is a great for people with a gluten intolerance and according to the magazine, maintaining a low-gluten diet may improve muscle recovery after a work-out. 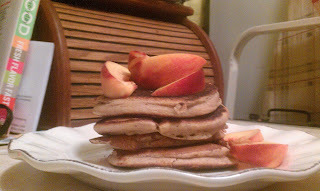 For the recipe go to Bon Appetit Spelt Pancakes. Delish!...I put this one up on our CEO of Everything page. I might have to highlight that homemade peanut butter with it too, when you get it up! I love pancakes!! Thanks for the post! Awesome! @Good Girl It was very yummy and healthy! @Jenina I love pancakes also, they are a favorite im my house! This is a good one too, love that it's made with whole grain flour. will have to bookmark and try it!